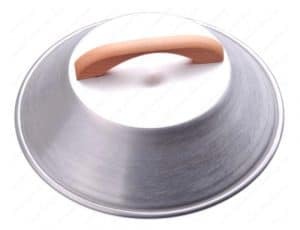 These aluminum lids cover every type of wok. All measure 2 Inches to 3-1/2 Inches in depth. Flat top dome shape with easy grip natural blond, wooden handle. A second, dome top style with a wooden knob is also available for 12″ woks, 14″ woks, and 16″ woks. (Lid sizes are at least 1″ smaller than the wok size). This aluminum lid has a customer rating of 4.3 out of 5.0 at Amazon. I own this lid myself and love it. The large wooden handle adds the perfect touch! You can own this great lid by going to this link at Amazon.